The trend, already popular in Asian capitals like Tokyo and Bangkok, is the latest international fad to sail into Myanmar since the end of junta rule in 2011 heralded a new era of freedom. 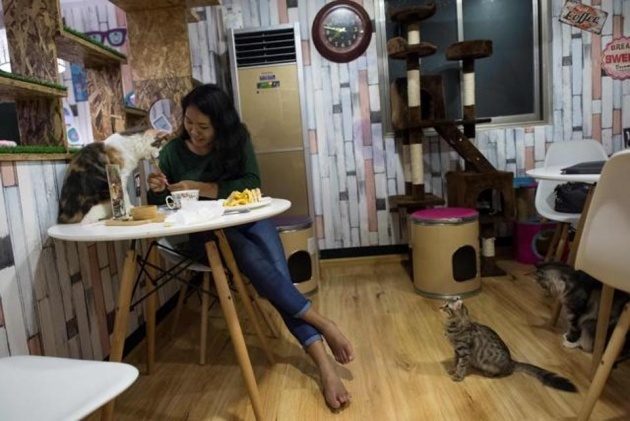 It may be raining cats and dogs in Myanmar, but in Yangon two coffee shops are offering animal-lovers a chance to escape the monsoon as the global pet-cafe craze sweeps into the rapidly changing city. Inside Yangon’s Catpuchino Cafe dozens of felines lounge around the room, some peeking out of baskets while others sit perched on fluffy stools or lie purring in the arms of adoring visitors. In the commercial hub Yangon, hip cafes and eateries have begun to mushroom across town to cater to an expanding middle class and growing population of expats. But while stray cats and dogs are a familiar sight on the city’s streets, few inhabitants have the space, time or money to squeeze pets into their already cramped homes.